The civilization of India is one of the oldest civilizations in the World, spanning more than 4000 years and witnessing the rise and fall of several Empires, and projecting a unique assimilation of various cultures and heritage. The Country has always been portrayed as a land of spiritual integrity with professors of Philosophy, who have engineered the magnanimity of its nationalism. One of the oldest scriptures in the World, the four-volume Vedas that many regard as the repository of national thoughts, which have anticipated some of the modern scientific discoveries, has been created in the orb of this myth oriented Country. This strong affinity with religion and mythology has been reflected time and again through various art forms and performing arts, which are symbolical of the composite culture of India. Unity in diversity is another facet of the Country’s inherent nationalism, which had been fused by the feeling of national fervour incited by various foreign invasions that ever made its way to the Indian shores. Religious tolerance and cultural amalgamation have given shape to a uniquely secular Nation, which has created an impressive status of itself in the global arena. Location: The Indian peninsula is separated from mainland Asia by the Himalayas. The Country is surrounded by the Bay of Bengal in the east, the Arabian Sea in the west, and the Indian Ocean to the south. Geographic Coordinates: Lying entirely in the Northern Hemisphere, the Country extends between 8° 4' and 37° 6' latitudes north of the Equator, and 68°7' and 97°25' longitudes east of it. Border Countries: Afghanistan and Pakistan to the north-west; China, Bhutan and Nepal to the north; Myanmar to the east; and Bangladesh to the east of West Bengal. Sri Lanka is separated from India by a narrow channel of sea, formed by Palk Strait and the Gulf of Mannar. Coastline: 7,516.6 km encompassing the mainland, Lakshadweep Islands, and the Andaman & Nicobar Islands. Terrain: The mainland comprises of four regions, namely the great mountain zone, plains of the Ganga and the Indus, the desert region, and the southern peninsula. Natural Hazards: Monsoon floods, flash floods, earthquakes, droughts, and landslides. Environment – Current Issues: Air pollution control, energy conservation, solid waste management, oil and gas conservation, forest conservation, etc. Environment – International Agreements: Rio Declaration on environment and development, Cartagena Protocol on biosafety, Kyoto Protocol to the United Nations Framework Convention on climatic change, World Trade Agreement, Helsinki Protocol to LRTAP on the reduction of sulphur emissions of nitrogen oxides or their transboundary fluxes (Nox Protocol), and Geneva Protocol to LRTAP concerning the control of emissions of volatile organic compounds or their transboundary fluxes (VOCs Protocol). Geography – Note: India occupies a major portion of the south Asian subcontinent. 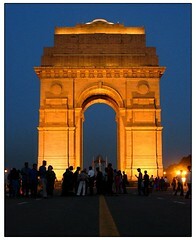 Population: India's population, as on 1 March 2001 stood at 1,028 million (532.1 million males and 496.4 million females). Population Growth Rate: The average annual exponential growth rate stands at 1.93 per cent during 1991-2001. Religions: According to the 2001 census, out of the total population of 1.028 million in the Country, Hindus constituted the majority with 80.5 %, Muslims came second at 13.4%, followed by Christians, Sikhs, Buddhists, Jains, and others. Languages: 22 languages have been recognized by the Constitution of India, of which Hindi is the official national language. Besides these, there are 844 different dialects that are practiced in various parts of the Country. Literacy: According to the provisional results of the 2001 census, the literacy rate in the Country stands at 64.84 per cent, 75.26% for males and 53.67% for females. Government Type: Sovereign Socialist Democratic Republic with a Parliamentary system of Government. Administrative Divisions: 29 States and 6 Union Territories. Constitution: The Constitution of India came into force on 26th January 1950. Legal System: The Constitution of India is the fountain source of the legal system in the Country. Executive Branch: The President of India is the Head of the State, while the Prime Minister is the Head of the Government, and runs office with the support of the Council of Ministers who form the Cabinet Ministry. Legislative Branch: The Indian Legislature comprises of the Lok Sabha (House of the People) and the Rajya Sabha (Council of States) forming both the Houses of the Parliament. Flag Description: The National Flag is a horizontal tricolour of deep saffron (kesaria) at the top, white in the middle, and dark green at the bottom in equal proportion. At the centre of the white band is a navy blue wheel, which is a representation of the Ashoka Chakra at Sarnath. Economy – Overview: Half a Century after gaining its independence, India has overcome all odds and achieved phenomenal standards of economic stability, courtesy the indomitable contributions of various sectors such as agriculture, tourism, commerce, power, communications, science & technology, etc., which have acted as the pillars of the Indian economy. India is today one of the six fastest growing economies of the world. The country is ranked fourth in terms of Purchasing Power Parity (PPP) in 2001. The business and regulatory environment is evolving and moving towards constant improvement. GDP – Real Growth Rate: The second quarter (July-September) of the financial year 2005-06 registers a growth rate of 8 percent. GDP – Purchasing Power Parity: India is the fourth largest economy, with US$ 3 trillion GDP in terms of Purchasing Power Parity (PPP) after USA, China, and Japan. GDP – Per Capita: As of September 2005, the GDP per capita of the Country stood at US$ 543. GDP – Composition by Sector: Services 56%, Agriculture 22%, and Industry 22% (As of September 2005). Labour Force: According to the Report of the Committee on India Vision: 2020, India’s labour force has reached approximately 375 million in 2002. Inflation Rate: 4.1% as on July 2005. Public Debt: The total Debt as on 31st March 2002 stands at Rs. 1372117.58 crores. Exchange Rates: Indian Rupee/ 1 US$ - 45.3700; Indian Rupee/ 1 Euro – 53.8600; Indian Rupee/ 1 Pound Sterling – 79.7100 (Latest rates). Agriculture Products: Rice, wheat, tea, cotton, sugarcane, potatoes, jute, oilseed, poultry, etc. Industries: Steel, garments, petroleum, cement, machinery, locomotive, food processing, pharmaceutical products, mining, etc. Fiscal Year: 1st April to 31st March.